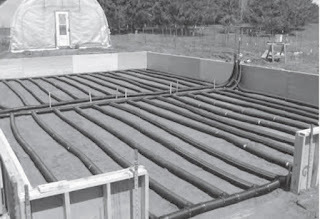 Build-It-Solar Blog: Heating Greenhouse Soil With Solar Air Heaters -- And Other Applications? Heating Greenhouse Soil With Solar Air Heaters -- And Other Applications? I ran across a paper from the University of Minnesota Extension that describes a simple way to heat the soil in a greenhouse through the winter using very simple solar air heating collectors. In a nutshell, the air heated by the solar air heating collectors is blown through corrugated plastic pipe that is buried in the soil under the greenhouse. A layer of insulation around the soil prevents the heat from being lost downward and outward. The results in terms of keeping the greenhouse soil and air warmer well into the winter were impressive. The nice thing about this scheme is that efficient solar air heating collectors can be built for about $4 per sqft and they are very fast and easy to build. The only other components to the system are a blower and a $10 thermal snap switch to turn the blower on when the collector is warm. Really simple. This all got me to wondering if this might not also be a good method to use with homes that use sand-bed heat stores for space heating. Currently, these designs use more expensive and more complex solar water heating collectors to store heat in the sand-bed. It seems like using simple, site built, solar air heating collectors would make the simple sand-bed solar heat storage system even simpler and more cost effective? Hey there! I'd be curious to know more about that U of M paper- was it about us? The system you picture is very similar to what we designed ten years ago, and have been running a winter CSA in Western Minnesota out of for years. 2. Auger 8" holes as deep as practical, as close as possible. 3. Cap a piece of 8" ABS on one end, fill with water, and cap the other end insert this assembly into the hole to just below grade. Voila! I guarantee your soil won't freeze in a sunny climate. Heat from the deeper soil will thermosyphon to the top of the pipe, making this is the cheapest geothermal system ever.